Small and light with a sleek new design, the VIXIA HF M50 camcorder has 8GB of internal memory to record up to 3 hours of stunning HD video. Image quality is unsurpassed, thanks to the camcorder’s newly designed, professional-level Canon HD CMOS Pro Image Sensor. The high-sensitivity sensor provides outstanding resolution, better low-light performance, and beautiful, natural detail in both shadow and highlight areas. Intelligent IS and SuperRange Optical Image Stabilization designed for the Genuine Canon 10x HD Video Lens make every scene clear and steady, and new built-in features make it easy to give your videos added creativity. Operation is fun and simple with a Flat Touch Panel LCD you'll control with your fingertips. This camcorder has the flexibility you crave: enjoy the convenience of recording in AVCHD or MP4 format to the internal flash drive or to a removable SD/SDHC/SDXC memory card. And now with built-in Wi-Fi®, you can immediately upload video from the camcorder directly to social networking sites via CANON iMAGE GATEWAY*, or your own home computer. You can also choose to upload video to your iPhone®, iPad® or iPod touch® by installing the Canon Movie Uploader app, and enjoy wireless viewing on your DLNA™-compatible TV. Building on Canon's decades of optical excellence, the VIXIA HF M50's 10x HD Video Lens produces extraordinary images. The high-performance Canon HD Video Lens uses low-dispersion glass to suppress chromatic aberration, delivering crystal clear video with excellent resolution, even at the telephoto end of the zoom. Super spectra coating technology lowers flare and ghosting. The lens also features an iris diaphragm. Normally found only on professional-level camcorders, the iris diaphragm produces highly expressive video with sharply focused subjects and beautifully blurred backgrounds. Equipped with the same high-powered image sensor found in professional models, the compact VIXIA HF M50 camcorder captures 1080p Full HD video with the rich, vivid quality of a much more upscale camcorder. The professional-level 1/3-inch native 1920 x 1080, HD CMOS Pro Image Sensor has a large pixel size that captures more available light to deliver superb imaging. Technical refinements including a thinner on-chip microlens, improved color filter transmittance and deeper, wider photodiode allow 20% higher light transmittance*. Additional light to the sensor means that video shot in low-light situations is brighter and clearer, with better noise suppression. The newly extended dynamic range is exceptionally wide, producing enhanced gradation and natural, lifelike realism in high-contrast scenes. *20% improved low-light performance compared to the Canon HD CMOS Pro Image Sensor used in Canon's 2011 VIXIA Camcorders. The camcorder's internal 8GB Flash Drive holds up to 3 hours of crisp, high-definition video safely and securely. With no moving parts, flash memory technology is perfectly able to withstand camcorder jolts or drops. You can also record to a removable SD memory card, making it easy to share your video with friends and family. Conveniently sized and readily available, SD cards give you up to 64GB (24 hours) of recording capacity for a combined capacity of 72GB or 27 hours. For added flexibility, you can even backup your video directly to an external hard drive by using the optional UA-100 USB Adapter. In addition to SD memory cards, the VIXIA HF M50 camcorder is compatible with super-high capacity Secure Digital Expanded Capacity (SDXC) cards. The same convenient size as a standard SD card, an SDXC card can hold up to 2,048 GB, and provides ultra-fast data transfer. It's an excellent option for family reunions, vacations and any time you know you'll require extra memory. With Relay Recording, you never have to worry about whether you're reaching maximum capacity on the camcorder's internal flash drive. When the internal drive is full, the system automatically switches recording over to the SD memory card. This reassuring backup system means you'll never miss capturing an important scene again. When it comes to saving your memories, the VIXIA HF M50 camcorder offers plenty of flexibility. In addition to traditional file storage methods, you can connect the camcorder directly to an external hard disk drive by using the optional UA-100 USB adapter to store video files safely and securely without a computer, an economical option for high-capacity storage on vacations or other trips. Using a USB connection, you can even play video on a TV via the camcorder. The VIXIA HF M50 camcorder gives you the flexibility of dual codec recording, allowing you to record in AVCHD or MP4 format, so you can pick the format that best suits your needs. AVCHD's higher bit-rate and finer resolution will yield the highest quality video for viewing on an HDTV or archiving to Blu-ray™. 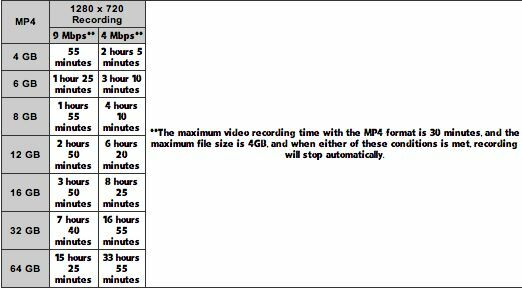 And for use with today's most typical video applications, the camcorder lets you record in MP4 format, too. 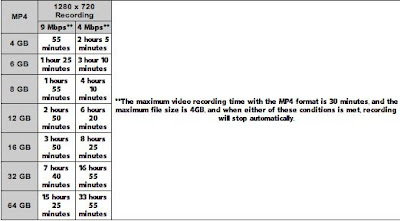 MP4 format produces files you can share right away - with no need for conversion. 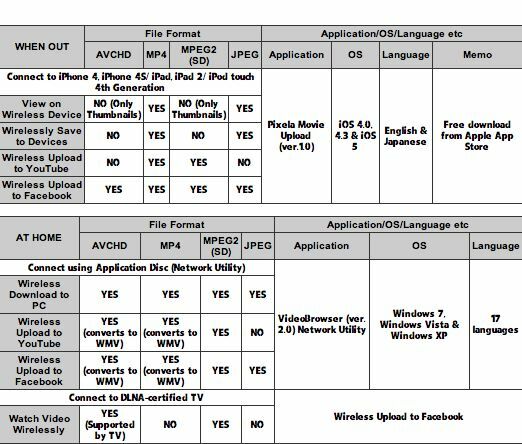 Video is immediately available to upload to social networking sites like Facebook™ or YouTube™, view on an iPhone™, iPad™ or iPod Touch™. Built-in Wi-Fi® opens up a world of new possibilities, giving you the connectivity and immediacy you expect today. The VIXIA HF M50 camcorder is a sharing device, ready to send your video wherever you like: delight faraway relatives with video of a wedding seconds after it took place; share video of your travels as they happen; post event-documenting videos online more. If you're in an Internet hotspot, you can share videos over the Internet by signing up on CANON iMAGE GATEWAY* - an online photo storage service that lets you upload to YouTube, Facebook and Twitter. The free Canon Movie Uploader app lets you upload video from the VIXIA HF M50 camcorder to your iPhone®, iPad® or iPod touch® device virtually anywhere. And when you send video to your smartphone or tablet, you'll find it conveniently filed where your other videos are stored. Shoot video in your living room, and save it to the PC in your home office over your home network. Wireless setup with the VIXIA HF M50 is as quick and easy as it is with your other devices, and you can register and store up to three networks for immediate retrieval any time. 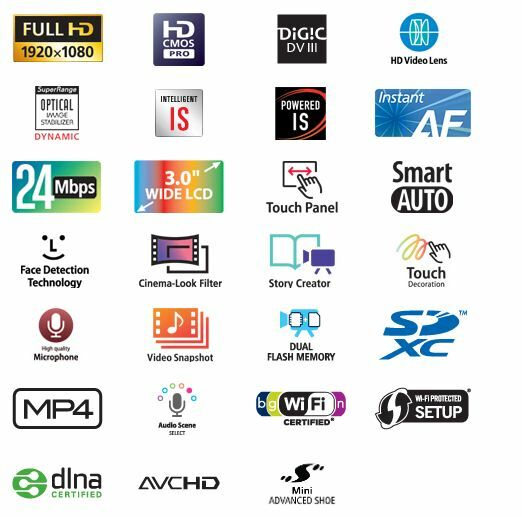 DLNA, the Digital Living Network Alliance, is a standard designed to increase connectivity between consumer devices of all types and brands. The VIXIA HF M50 camcorder is DLNA-compliant, and now so are many HDTVs. That means that you can use your home network to access the video stored in your camcorder with the remote control of a DLNA-compliant TV. Even if your HDTV is not DLNA-compliant, the devices connected to it (including game consoles and Blu-ray™ players) may be, which will allow you to take advantage of this feature. Intelligent IS makes it easy to shoot clear, sharply focused video, even in situations that typically cause camera shake. The Intelligent IS system analyzes the shooting situation for you, then automatically switches to the image stabilization method best able to produce sharp, steady video. Four IS systems cover the gamut of shooting situations. Dynamic IS corrects minor movement and the shaking caused by walking while shooting. Macro IS delivers perfectly steady close-up shots. Powered IS comes into play when you're using the camcorder's powerful zoom, correcting shake that can occur in telephoto shots. Tripod Mode stops IS when the camcorder is stationary. The VIXIA HF M50 camcorder's audio is an excellent match for its pristine image quality. The microphone has updated elements that increase clarity at medium and low frequencies, so even faint sounds are recorded clearly. Three microphone positions let you adjust recording to suit the position of the zoom or your subjects: front for monaural recording; regular for normal stereo effect; and rear for a wider, more enhanced stereo effect. Frequency response characteristics can be adjusted for the scene with several options. You can balance all frequencies for normal recording, emphasize low frequencies for impactful live music recording, attenuate low frequencies to reduce ambient noise, emphasize mid frequencies to focus on voices, or emphasize low and high frequencies to record live music with balanced lows and highs. Canon's optional WM-V1 Wireless Microphone allows you to record high-quality audio without wires from up to 164 feet away (50m), making it ideal for ceremonies and recitals. For the ultimate home theater experience, the optional 5.1-channel Surround Sound Microphone SM-V1 captures audio quality that matches the stunning realism of your HD video. Five distinct pickup sensors capture sound from all directions, making your home movies look and sound more lifelike than ever before. Big and bright, the VIXIA HF M50's 3.0-inch Flat Touch Panel LCD provides super intuitive control that feels instantly familiar. With a touch, you can shift focus immediately to any subject. Exposure for any area of the screen can be controlled with a touch as well. And with Touch & Track, you simply place your finger on a moving subject and the focus will follow that subject. "Pressable" buttons are also available for selecting settings and controlling camcorder operations on-screen. A new Home button on the camcorder takes you to the main LCD screen, where clear explanations of shooting modes and recording settings help you make informed choices for an exceptionally simple and enjoyable shooting experience. Smart AUTO lets you capture clear, bright, well-focused video while the camcorder takes care of all the details. The system recognizes 38 shooting situations based on numerous factors, then automatically chooses the optimal settings for the situation. When you shoot a nearby subject in telephoto zoom mode, Auto Tele Macro gives your video the high-end artistic effect of a well-focused subject against a beautifully blurred background. Using the camcorder's LCD screen and an included stylus, you can embellish your recorded video freehand: draw graphics, write words, it's completely up to you! With a choice of 27 different frame graphics, clip art and animated effects, you can give your video a whole new dimension. New, easy-to-understand icons have been incorporated that make options for animated effects clear at a glance. Creating a compelling video that truly documents an important event can be challenging, so the VIXIA HF M50 camcorder steps in to help with Story Creator. The feature is even easier to use than ever, so now even beginning videographers can cover an event with confidence. Before shooting, you'll see a list of scenes you'll want to be sure to catch for several different types of occasions. And now each scene selection includes specific shooting tips that help with scene structure and composition, including suggestions for wide-shots, close-ups, even recommendations for length of shots. 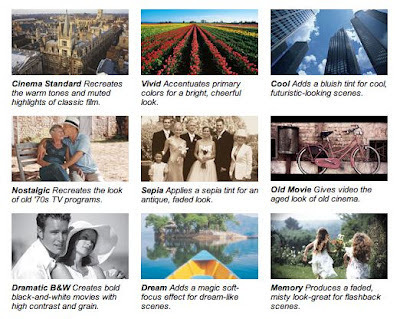 After shooting, you can watch your video in coherent story order based on each scene's theme, as opposed to the order in which each scene was shot. 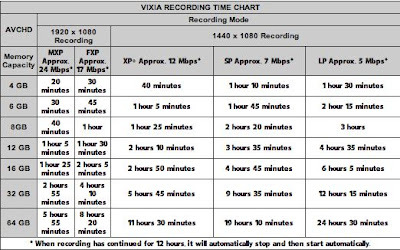 The VIXIA HF M50 camcorder's sophisticated shooting mode options offer superior creativity and functionality. 24p Cinema Mode gives your video a film-like feel, making it look as if it were shot at the same frame rate as movie film, with a frame capture rate of 24p recorded at 60i. The camcorder also gives you the option of recording in 30p Progressive Mode, which is ideal for clips you intend to post online. Wireless Microphone WM-V1 and other applications. Item Reviewed: New Camera- Canon VIXIA HF M50 9 out of 10 based on 10 ratings. 9 user reviews.